To paraphrase one of the most famous tag lines in movie history...is it a concert or is it a film...the answer would still be the same. Superman...thankfully Elton kept his underwear right side in and his super powers right side out. Whilst wearing a cape. What did this unique experience have to offer...lets dim the lights and get comfy. The idea of the concert film is nothing new...as far back as the late 60's, Monterrey Pop, Woodstock and probably the greatest of them all Let It Be(1970) established the genre. Elton himself got in on the act with To Russia With Elton in 1979. Whereas they all mixed offstage footage and interviews with the stage element, the idea of a full concert film is a relatively recent idea. For Elton's first venture into this territory there was only really one show that could fit the task. I'm sure everyone reading this knows the background to the Million Dollar Piano show. Without going over the why's and where's, I'm merely going to do a review of the actual film. Which on paper (and ultimately in practice) sets out to showcase Elton's music. The Good, the Better and the Greatest. There's no song in the set list that is alien to any Elton fan. Not even the casual fan would go home with their monies worth not realised. Because when they hear the non-hits they've been sucked into a world that up to that point they weren't aware of. You can be certain they left the venue yearning for more. The version of Mona Lisa's And Mad Hatters that developed from the show and went on tour is one of the all time greats. Davey's mandolin, the Mandolisa it's called and designed by friend of this blog Traci at Imagine Loving Art...when it could be heard (more on that later) is beautifully uplifting that works perfectly against the The 2Cello's plaintive, melancholic sound. The harmonies of the girls are measured superbly. A solo Your Song with Elton explaining how it came about might sound borderline repetitive (to the diehards) but he still makes it sound (especially for the casuals) an essential part of the show. All of which leads us to the middle act. Where the real scene stealers happen. The band (and their gear) retreat to the shadows in a holding pattern to allow Elton and Ray renew combat. Both against other and with each other. A right pair of Gladiators! The brief snapshot of them both in the middle of the show is more than a cameo. Better Off Dead is full of percussive force. In the shadows the wonderful harmonies on the middle eight creep through to add that uniqueness to the version. Indian Sunset...I'm not sure you can say much more about it at this stage. But let's try...Elton's vocal on it's own at the start has the crowds attentions and emotions grasped with it's strength and gusto. If you watch him when he's playing the solo parts, the look of concentration on Elton's face is incredible. He's not coasting through it, he's putting his full back and more into it. Hence the result, an expansive fast moving passage that's sharp and diverse. Ray's accompaniment is often brutal at times, sad with flashes of joy but never dull. He's got Bernie's lyrics perfectly showcased. This (too) brief two hander...well four actually...rightly deserves all the praise lavished on it. To hear and see one of the most unique type of twosomes ever to come out or rock and roll is a privilege. The pleasure is both the performers and audiences. ...so what better way to bring down the curtain on a movie than with a movie song. Movie in terms of where it can from and moving in terms it's delivery. Circle Of Life with it's elongated intro on it's own would possibly be statue awarding. To hear Nigel, John and Ray adding their own each unique percussive beat simultaneously was incredible. It was thunderous, the repeating of it over and over built the tension up steadily that at no point did you expect to burst. The rhythm was relentless. The backing singers chanting and bubbling under this current of celebratory beating of hearts and minds merely focused the moment with even tighter intensity. Until that is Elton returned and his ''uh-oh's'' heralded his final scene. Bit this merely wasn't a reenactment of something on disc. This version took it to another place. A greater place. All boxes ticked were ticked, the driving chorus with the hammering riff from Davey. The final verse even had that trademark guitar lick from him that the original has. The final chorus was like the ride off into the sunset. Tremendous harmonies lifted the emotions up and held them tightly. In any other instance that would have been enough for any mortal. But what gave it life everlasting is when Ray Cooper chimed in on the tubular bells. That simple addition in films was always used to herald a heavenly theme...and there we were. Up above and looking down. The hero's had saved the day again. Easily the best version ever of the song. The film clips that were used, whilst not visible at all times, were in better keeping with the songs than The Red Piano film clips were. Tiny Dancer's was a simple affair that was filmed in such a manner that seemed 3D. The Goodbye Yellow Brick Road clip is one of the best, again simply done but says so much. As I mentioned above, Circle Of Life is a terrific show closer. If the ears are bent into shape by it then the eyes will certainly have their lashes waxed. From the heat of the African skies that light up and swathe all over the stage and the personnel like fire. Not just any old fire, but a Towering Inferno that the heat from nearly moves from imaginary to real. I did get a bit hot in the cinema near the end...who knew!! Overall it was a tremendous showcase of Elton the live performer. It's not the same as being there in Las Vegas or seeing Elton live anywhere for that matter. That's a special moment, celluloid and now digital can't recreate that. But what they have done is shown a concert that is all things to all people. His music, Bernie's words, Gary Osborne's words, Tim Rice's words are all introduced to the newer fan and renewed for us. The band were without fault...they always are...the 2Cello's added support at the right times. They took their cues well. The singers were polished as per usual, they picked all their moments carefully. The picture quality was excellent, sharp and clear. The colours of the staging and lighting were delicately captured. The picture mix however at time bordered on comedy. Facial and head hair seem to grow, be cut and grow back again with amazing regularity during the space of one song. They obviously went for optimum over all performance for a song by splicing multiple performances together, but they could have done a bit better with that aspect of it. I suspect Robert Webb to have a whole episode of his Movie Mistakes programme on BBC3 put aside for it. The good aspects of the picture mix were the infrequent (thankfully) snaps of the audience. I know what people look like...though during Saturday Night's Alright it did catch some great shots of a charming young lady and her charms on stage. Elton certainly caught an eyeful...lucky man!! The view from above was a clever device, hopefully in the DVD releases multi angle viewing might be an option. Now to the sound quality. Something that can make or break a music presentation. Overall the sound was clear but wasn't without it's faults, unfortunately. The mix in a lot, though not all places, was wrong. Very wrong. Elton's sound people are the best. I've never had any complaints with the shows I've been to, whether they be in a tent, an indoor arena, an outdoor stadium or the garden of a stately home. When soundboard recordings in their purest form surface they are perfectly balanced. If you want a recent excellent example, the WALMART show is a prime one. Maybe I was expecting too much, but I've never seen any of these music presentations in the cinema before. So I wasn't quite sure what to expect. I'd have thought they'd have made more use of the surround aspect of the cinema sound system for example. Elton's piano and vocal was up front, music to some people's ears but I got issues with that. Somebody somewhere has taken a decision to go against best practice, in other words Elton's own sound engineers, and distorted the overall delivery. For example on Mona Lisa's and Mad Hatters the mandolin and the cellos were too quiet. It's not as if they were drowning out Elton in the first place. Kim's keyboard and Davey's guitars again seemed washed out on occasions. Not too often thankfully, hopefully it'll be rectified for the DVD release. The percussion too at times wasn't as up front as it would be in real life. With Ray Cooper doing his thing, not a good idea. The bass too wasn't as punchy as you'd hear at a real concert, which was a great shame. It didn't have that in 'your gut feel' that runs through your body. Bob Birch, who I'll speak more of later, was a master of his 5 string and those lines deserved their usual prominent place. I suspect this music concert in the cinema lark is in it's infancy and they'll get the sound thing resolved. But at the moment I don't think it's matching the visual delivery by any stretch of the imagination. Overall it didn't detract fom the show...my keen ear does get a bit touchy if things just ain't right!! The omission of Hey Ahab was a bit odd. It works great live, the weaving of Davey and the 2Cellos on the outro is the ultimate payoff. Plus Lisa Stone owning it too. If they'd have left out I Guess That's Why...I doubt there'd be too many furrowed brows. But the balance of the setlist was still weighted perfectly. The show is dedicated to Mark Fisher and of course Bob Birch. Mark designed the stage and brought a touch of class to it. Quite a bit in fact. It wasn't tacky or plasticy, it brought the cavernous stage into a more humble and intimate looking setting. Bob in the film did what he always did best. He played and sang his parts with with the freshness as if he were playing them for the first time but with the benefit of 20 years doing it under his belt. It was by good grace, God's grace maybe, that he's been captured for evermore. Bob was taken from us but those performances can never be taken. The film had immortalised them. The cinema had somewhere between 50 and a 100 maybe. It was hard to judge in the dark...they say you meet a better class of person in the dark sometimes so I guess they were all great!! Thankfully there were no loud singers that were under some illusion that we'd come along to hear their untuned warbling. I'd have watched that on The Voice at home if I had such a masochistic tendency. Singing at a concert is a given, but we were at a film. Not quite the same thing, though we did find a La La La in us...the whole purpose of the event was to see and hear Elton doing something unique (the MDP show) in a unique environment (the cinema). Overall I thoroughly enjoyed the whole event. They picked a great show to show as visually is immense and aurally it's epic. Unfortunately they only did one viewing, but at least I caught the 'moment'... the last time I was at the cinema a man played piano at it and we read the words. This time one man did both...hopefully we won't have to wait another minute to see and hear something just as good. Or groundbreaking. This review drew me into another world. Since I could not afford to get to Vegas to see the show, the images portrayed in through writing enabled me to envision and almost experiencd being there (yet feeling the sting of reality that i was not there). I am more anxious than ever for the release of tbis DVD.! 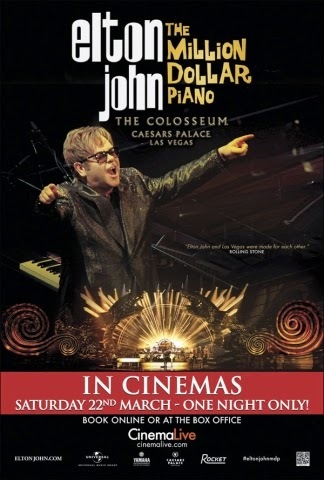 Thankyou for your review, and thankyou EltonJohn.com for the film's impending release. Thanks for the kind words, Stacie. Glad you enjoyed it! !